No one can deny that heavy-duty trucks play a significant role in our economy. They are a key link in the process of transporting goods from manufacturers, producers, and growers to the consumer. Heavy-duty trucks travel from ports, where the goods arrive into our country, to local distribution centers that then move the product to local stores or directly to consumers. The problem is that heavy-duty trucks contribute a significant portion of local GHG (Greenhouse Gas) emissions and, consequently, pollution in our communities. There are jurisdictions where this pollution issue has been identified, and programs are being developed to alleviate it. The authorities in charge of the LA and Long Beach Ports, the largest and most active ports in America, are taking a leadership role in developing alternate transportation solutions. In a recent bold step, they announced they are encouraging the phase-out of diesel trucks in favor of zero-emission trucks and cargo-handling equipment over the next two decades. The policy mainly affects trucks that haul loads in short trips to and from the ports, namely drayage trucks. Recent projects by Kenworth, UPS, and Toyota are demonstrating that this is a realistic and attainable goal. Zero-emission technology is viable and proven solution. When looking at zero-emission solutions, the issue of fueling/charging is an important one. Heavy-duty freight vehicles typically operate long days and can’t stop for frequent breaks in order to maximize on deliveries and revenue. Charging batteries en route is not be a feasible option. There is, however, another solution: hydrogen powered fuel cells. 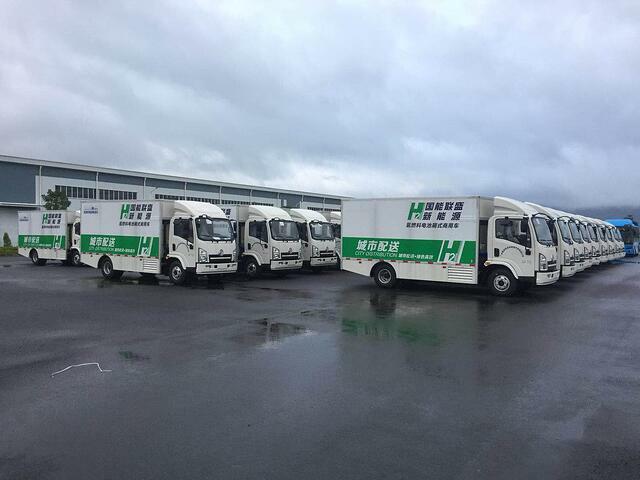 Hydrogen truck refueling is much faster than charging batteries. With refueling times as low as 10 minutes, the refueling process is nearly the same as fueling with CNG (Compressed Natural Gas). This makes the transition from diesel powered engines to refueling fuel cells with hydrogen relatively easy and straightforward. There are other factors that make hydrogen the ideal fuel solution. Heavy-duty trucks operate in fleets, and on well-defined routes. Two good examples of this are city delivery trucks returning to a central depot at night and drayage trucks operating at a port. Hydrogen fueling stations can therefore be installed at these centralized locations (depots and ports), for convenience. Additionally, the hydrogen fueling stations can be shared with other hydrogen applications besides trucks, like personal vehicles and light delivery trucks. Fuel cells also provide rated power at all times, as long as fuel is being supplied. A disadvantage of battery electric vehicles is that the power available decreases with the voltage-based state of charge. The infrastructure developed for fueling trucks will likely mimic what’s already been developed for transit buses. Buses and trucks already have a few features in common: similar vehicle size, and similar capacity needed to fuel a fleet of vehicles at the end of a day. There are a lot of lessons to be learned from the experiences of those at transit agencies and industrial hydrogen plants. In California, AC Transit and Sunline Transit have installed, and actively use, onsite hydrogen refueling stations. The technology and processes are clearly viable and proven. Onsite production: hydrogen is produced by either electrolysis or steam methane reforming. Electrolysis involves the separation of the hydrogen from the oxygen using electrolyzers while steam reforming uses methane and water vapor to produce hydrogen. Offsite production: hydrogen is often a byproduct of industrial processes, and can be captured and stored for later use. The hydrogen can then be delivered by truck to the refueling station. The port of Rotterdam is a great example of leadership in this area. In 2012, a world-scale hydrogen production plant was built in Rotterdam. The region plans to take advantage of this hydrogen to supply the fueling infrastructure at the port. Through this platform, they are contributing to the development of hydrogen-powered trucks for container transport in the port. It’s important to understand that the size of the hydrogen refueling infrastructure directly relates to the truck fleet size. A key consideration in this respect is ensuring that there is enough hydrogen available for the current fleet, while still taking future growth into account. Hydrogen is the ideal replacement fuel for diesel in heavy-duty trucks. We are at the beginning of the transition from fossil-fueled internal combustion engines to zero-emission transportation. By applying the lessons learned about hydrogen infrastructure from both transit agencies and industrial companies, future innovators will find the transition to the fuel easier. More zero-emission mandates and policies are also being put in place over time. Moving forward with viable solutions is the key to keeping our communities clean and thriving. Learn more about fuel cell-powered truck innovations in this free presentation. Download: Zero-emission Fuel Cell Solutions for Freight Transportation.